1. I applied a layer of Essie protein base coat. 2. Essie's mint candy apple was my base color of choice: a birthday gift from my friend Ty Huynh! 3. I went with Essie's mod square (hot pink) for the accent nail and waited for the mint polish to dry. 4. I drizzled a bit of mod square at the top of each mint nail to simulate dripping ice cream. 5. Carefully, I cut out the decals I wanted to use and stuck them to my nails per Rudy's instructions. 6. I topped everything off with a layer of Seche Vite top coat. I am seriously terrible with fancy nail polish designs, but this one was fairly easy because the drips didn't have to be perfectly uniform. I remember it lasting at quite a few days. The decals didn't show up as well on the hot pink accent nail, which wasn't a surprise because Rudy includes a warning about the decals working better on pastel colors. It was still cute, though, and it worked really well with the mint candy apple. 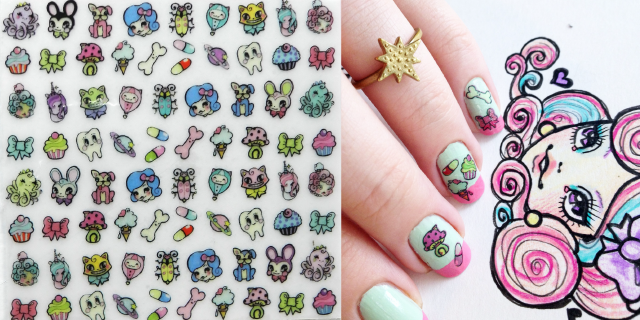 Here are some pics of the decals from the shop listing that show the variety of cute drawings she included. How fun are these? The whole set was just $10. Note: All non-watermarked images in this post belong to Rudy Fig. hey Kelsea, first off - thanks so much for your lovely comment on my poem! definitely made my week. secondly, wow these are so cool! I have never even tried decals before. I definitely should because these are so so cute! No problem, Angie! I hope you continue to share your writing as I think you've got the talent for it! YES I love these decals! I'm usually too lazy to do my nails so these are the only decals I've ever used... haha. They were too cute to pass up. I am also too lazy. I think I'd be fine if it didnt take so long to dry and if they didnt chip after on day but unfortunately haha. <3 Thanks for visiting, Jessica!